I spent a good part of yesterday editing copy for the November/December issue of Northern Gardener. (It’s going to be a good one!) 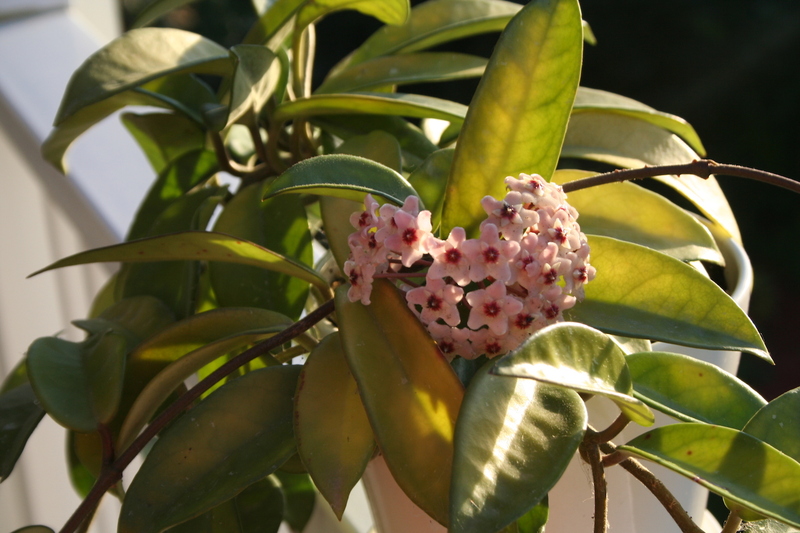 And, one of the columnists wrote about care of common houseplants, including Hoya carnosa or wax plant. I have a wax plant that came from a cutting from a plant my grandmother kept for many years. She died in 1985, and the plant has been thriving in my mom’s house and my sisters’ houses since then. Needless to say, it is a resilient houseplant, enduring each winter on the counter near my kitchen sink, then spending the summer on the bright—and lately, rain soaked—deck. The column mentioned in passing that Hoya carnosa will bloom once the plant is root-bound. Really? This struck me as surprising since as far as I knew none of our plants had bloomed ever. So I called my mother. “Has your Grandma plant ever bloomed,” I asked. “No, never,” she replied, though her plant does have leaves that change color and become beautifully variegated whereas mine always has green leaves, even though they are cuttings from the same original plant. I went back to work, and later that evening was rearranging some furniture in a spare room we have. A plant would look nice on that bookcase, I thought, and it’s about time to bring the Grandma plant in from the deck. Well, you know the end of the story. I went out to the deck to get the plant, which I hadn’t even looked at in weeks other than to note that its pot was flooded with water, and there were two big, beautiful, waxy blooms. My “Grandma plant” in bloom. It’s called Hoya carnosa. Was it the sun, the natural rain (as opposed to our alkaline tap water), that dab of fish emulsion I poured in the pot back in May? Had it finally become root-bound enough to throw up a flower? Maybe it was just time for the plant to wake up and bloom. It certainly woke me up, and that is often the point of keeping a garden. Plants continually amaze us with their ability to endure neglect, bad weather, crowded conditions, disease, and insects, and still bloom and fruit and grow as best they can. Our tiny efforts to make things better for them—by cleaning up the garden, by digging in compost, by making sure the plant is placed where it can thrive—are almost always rewarded with excessive gratitude and abundance. And, plants often surprise us and delight us and push us to look more closely at the natural world, at dozens of small, bright, stars made of tissue that looks like wax. My personal observation has been that Hoyas are most inclined to flower when they’re getting slightly sunburned (visible as a slight yellowing of the topmost leaves). I’m pretty sure being rootbound can’t be the signal, because I potted up some cuttings of H. lacunosa somebody sent me in mid-May and stuck them under a 4-foot fluorescent light, and I had flowers by July. Only one set of flowers, granted, but still — there’s no way that plant was rootbound in six weeks. Mr. Subjunctive — The sunburned theory certainly makes sense! One reason I thought of moving the plant back in the house was that its leaves were yellowing. Thanks for stopping by! As one of the sisters who used to have a “grandma plant,” I have to say that I am impressed. If you remember, I gave mine to you or mom years ago because I didn’t want to be the first one to kill it — too much pressure. Bravo to you for getting that thing to bloom. I haven’t seen anything but green on any of those plants since the mid-80s!